This is the place where you can set yourself free, breath the fresh air, let go of it all...and just BE ! The Spirits of the Wilderness awaits. Let us gather with them to dance once again, in celebration of Life, Love and Unity. The LoveStory of Skogtroll must go on! It is time to go WILD! 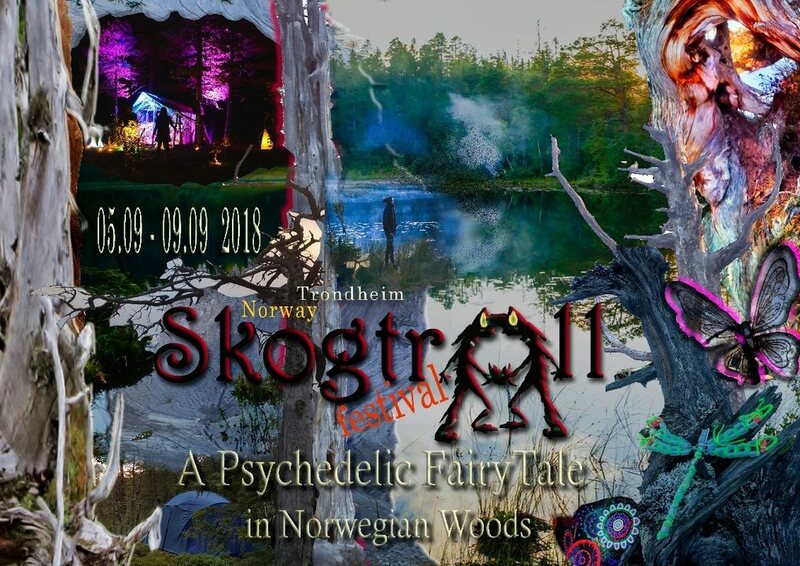 Skogtroll is not only a Psytrance gathering, but a real WildLife experience where you truly connect with powerful, mysterious, beautiful nature. Our location is magicaly situated by a small forest pond, surrounded by mystical, old, crooked pine trees and wet marshes. This is the party you will never forget! You will be required to walk on foot for about 40 mins through rugged terrain to get there. There will be spaces under roof in case of rain, and there will be cozty fires, of course! There will also be a forest kitchen serving warm vegan meals for a friendly price. As true creatures of the Wild, we have an obligation to take good care of our natural habitat. Make sure you leave no trace but from the tracks of your feet. Take all that you bring into the Wild back out with you when you leave! Skogtroll encourages a true and healthy lifestyle and does not support the use of addictive substances! Please respect norwegian law regarding drug use. Make good choices, stay safe and enjoy the music and nature! Please send an email to skogtroll@inorbit.com and tell us a little about yourself and we will get back to you as soon as possible. WORKSHOP? SHOP? IDEAS? ANYTHING YOU WANT TO SHARE? Magical Skogtroll Woods, near Trondheim, Norway. * The closest airport is Trondheim airport Vaernes (TRD). From there, take a train to Hommelvik Station. The train costs around 4€ and takes about 10 min. * The closest train/bus station is Hommelvik Station. * There will be a shuttle service from Hommelvik Station to the location. More info on this will be announced when the time is right.. !! NB !! YOU HAVE TO REGISTER FOR THIS EVENT !! NB !! Even if you want to get your ticket in the woods! *To get your ticket at the forest gates, choose ticket option "TROLL GUEST"
Important info and final directions will be sent only to those on the guest list!